Ready to take your quilting to the next level, but don't have the space for a longarm at home? The Sewing Palace is offering you the next best thing! You can now rent our BERNINA Q24 machine to finish your UFOs. A longarm specialist will be available to you during your entire rental time to answer questions, wind bobbins and change your needle if needed! Rental hours will be available to you once you've completed your Longarm Certification Class. This class costs $50-$75. Dates for certification will now be made by appointment - please call the store at (406) 443-5724, to reserve a date. Rental is only available to those who have completed our Longarm Certification Class. Our BERNINA Q24 Longarm machine will be available to you for $20 per hour, with an initial pre-paid rental time of 2 hours. Rental time will be available in pre-scheduled, pre-paid sessions Monday - Friday. We recommend starting out with simple all over designs/design-combinations in order to get the most out of your rental time. You will be responsible for providing your own thread, purchased from The Sewing Palace. We will sell you Q24 bobbins to use when you rent our machine. You will be responsible for providing your own batting. We recommend that you square and press your top and back prior to your rental time. If you need access to a larger ironing board or cutting table, you may arrive early to utilize our classroom to prepare your project, however your rental time will start at the scheduled time whether you are ready to load or not. Please make sure you come prepared to quilt and HAVE FUN! If that means you'd like to bring your headphones and iPod to jam out while you quilt, we fully support that! Please bring your bobbins, thread, snips, and anything else you want to have while quilting. Pictures of your quilting ideas, are always helpful to have with you. Please do not bring your dog, cat, children or significant other! This is time for you to enjoy the creative quilting process. If you have further questions or concerns please feel free to contact us, we will do our best to answer them. 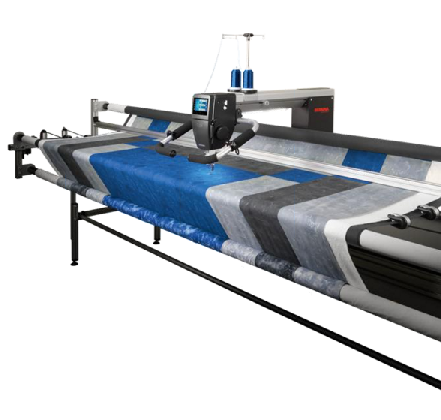 For full details of our Longarm Policy and to sign up for the Certification Class, you may email us at palace@thesewingpalacebernina.com or call the shop at (406) 443-5724.